This gorgeous diamond and gray pearl brooch, in the design of a stem-like pin embellished with a ribbon, is one of the many jewels that came into the Dutch royal collection during the reign of Queen Wilhelmina. In recent years, the large brooch has become a favorite of Queen Maxima. There's speculation that this grand round pearl and diamond brooch from the Spanish collection was originally owned by Queen Isabel II. If that's true, it's one of the oldest pieces in the collection. Queen Sofia wore it often in her early years as queen, but it's not been seen recently. I'd love to see either Sofia or Letizia pull this one out of the vaults again! This style of pearl and diamond brooch, with a pear-shaped pearl drop suspended from a round pearl and diamond element, is fairly common in various royal collections. But for my money, the grandest example is the pendant brooch that belonged to Queen Mary's grandmother, the Duchess of Cambridge. Made by Garrard in the middle of the nineteenth century, the piece is an important family heirloom. It was worn by Queen Mary at the christenings of both Queen Elizabeth II and the current Prince of Wales, and the Queen still wears it regularly today. Most pearl brooches use pear-shaped pearls as pendant drops; however, the pearl and diamond brooch in the Luxembourg grand ducal collection features a pear-shaped pearl set upright in a fleur-de-lis design. The brooch originally belonged to Princess Ingeborg of Denmark, the mother of Queen Astrid of Belgium. Astrid's daughter, Josephine-Charlotte, married Grand Duke Jean of Luxembourg and brought the brooch with her to her new country. Today, it's a favorite of Grand Duchess Maria Teresa. The diamond strawberry leaves of this lovely brooch are punctuated by a large central pearl and elaborated by a large pearl pendant drop. And even better: the leaf element can be worn with the center leaf pointing up or down, giving this brooch an extra bit of versatility. It also has an important historical provenance, as it originally belonged to Queen Sophie, a Wurttemberg princess who was married to King Willem III of the Netherlands. This elaborate diamond brooch, with its five pearl pendants, is a part of a married parure with several other pieces of Danish jewelry, including the massive Pearl Poiré Tiara and the suite of pearl and diamond jewelry given by the Khedive of Egypt. The brooch itself was a part of the jewel collection of Princess Louise of Prussia, who was the wife of Prince Frederick of the Netherlands. Louise's granddaughter, Lovisa, became Denmark's queen in 1906, and she brought the brooch with her to Copenhagen. The jewel collection of Josephine of Leuchtenberg is a gift that just keeps on giving. This particular brooch, set with pearls, diamonds, and rubies, is floral in design. It was a gift from her husband, King Oscar I of Sweden, and the five pearls in the setting represent their five children. The brooch was a great favorite of Queen Louise of Sweden, and in recent years, Queen Silvia has worn it often as a hair ornament. This beautiful round brooch, with pearls nestled among the diamonds as well as suspended as pendants, is one of the British heirlooms of the crown. It was a favorite of the late Queen Mother, and it was one of the pieces that she kept in her jewelry box until her death in 2002. 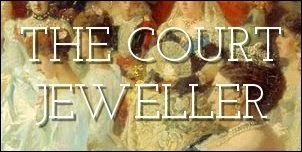 Her daughter, the Queen, has begun wearing the piece regularly. The Norwegian royal collection includes a gorgeous scrolling brooch of diamonds and pearls. It was one of the gifts given to Queen Maud on her wedding in 1896. Today, Queen Sonja wears the brooch often, pairing it frequently with her multi-stranded pearl choker necklace. She also loaned it to her daughter-in-law, Mette-Marit, who wore it at Crown Princess Victoria's wedding with the replica version of Maud's pearl tiara.